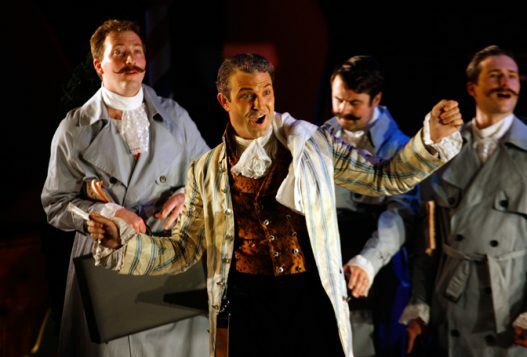 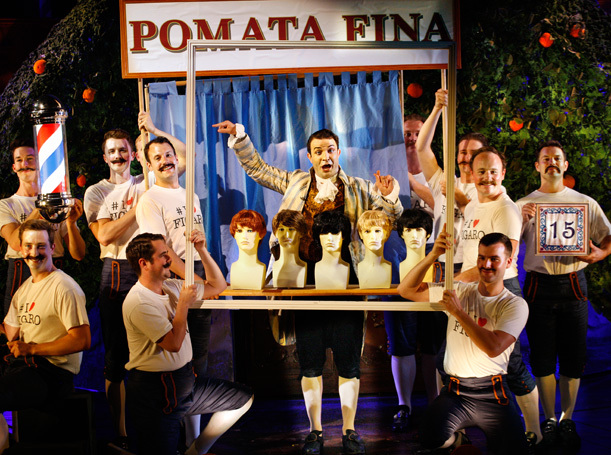 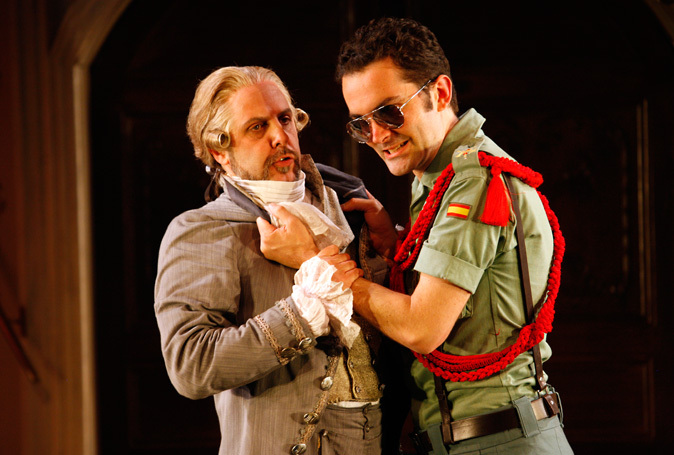 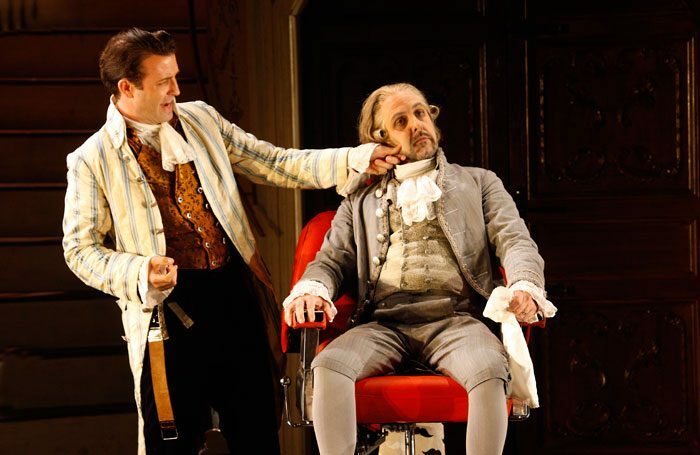 Rossini’s The Barber of Seville requires a fine balance between fast-paced slapstick and stand-and-deliver vocal showpieces, and an enjoyable new production from the Grange Festival Hampshire of this opera buffa charmer mostly gets the balance right. 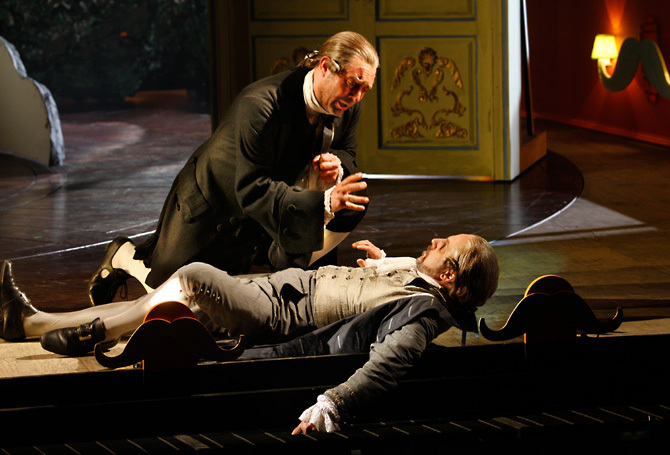 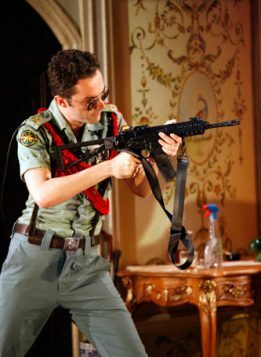 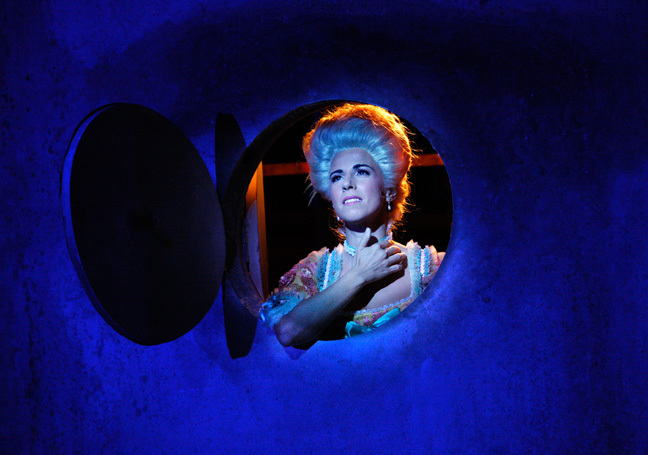 The plot, such as it is, revolves around the efforts of Count Almaviva – aided by Figaro, the barber of the title – to woo Rosina and spirit her away from her aged guardian, Doctor Bartolo, who plans to marry his rich young ward. At first, this production is a slow burner, with some less-than-gripping duo scenes. 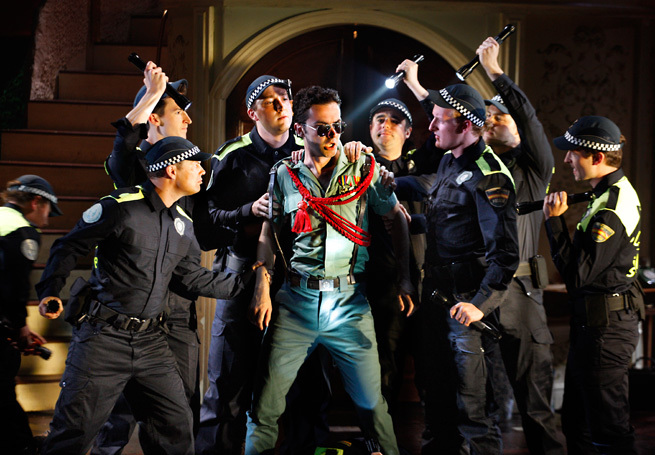 It isn’t until some way into the first act that things start to ignite, largely thanks to excellent teamwork from the all-male chorus, sometimes sporting the effusive moustaches that are a leitmotif, even worked into the moveable indoor/outdoor set (a witty design by Andrew D Edwards). 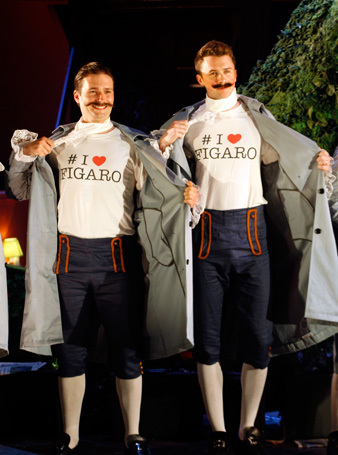 Costumes and props shift rapidly between eras, often to humorous effect, as when Bartolo, in 19th-century garb, reacts with puzzlement when handed a mobile phone, or when Almaviva ingratiates himself into the household dressed as a missionary, a la Book of Mormon. 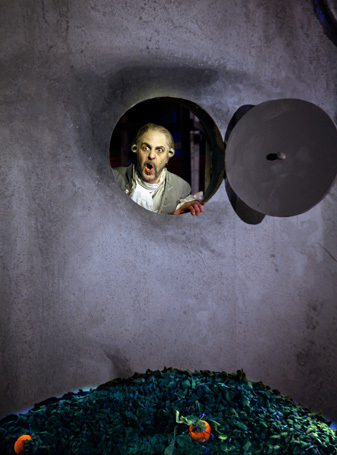 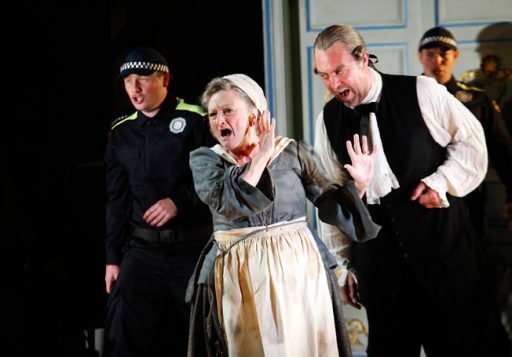 Less persuasive is the frequent breaking of the fourth wall, as when characters converse with David Parry while he conducts the Bournemouth Symphony Orchestra in the pit. 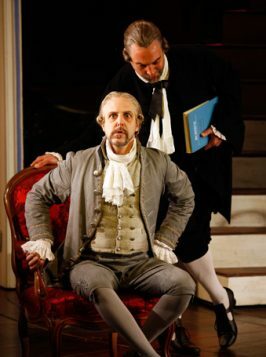 Charles Rice as Figaro is a charismatic presence right from his famous first aria, while David Soar as the heavyweight Don Basilio also boasts impressive talent. 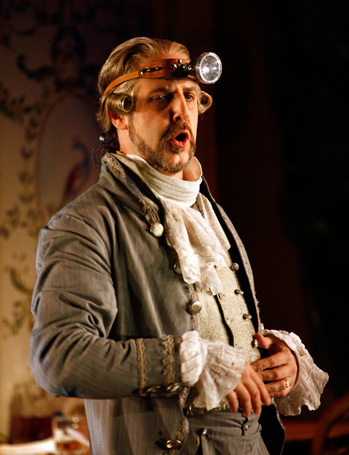 Riccardo Novaro has the right amount of befuddlement as Bartolo. 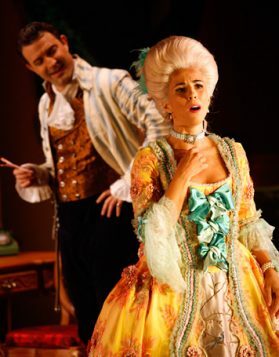 Jose Maria Lo Monaco brings a vibrancy to Rosina; her suitor, Almaviva (John Irvin), has the required vocal suppleness but not the comedic timing. There’s a show-stopping aria from Jennifer Rhys-Davies as Berta, the chain-smoking maid with a dream or two.